This Miniature Australian Shepherd nicknamed Black Tri Male #4 sold and went to a new family. Both parents raised on a 40 acre farm with goats, horses, free roam chickens .They help on the farm during the day and snuggle with us every night . Both parents enjoy camping trips and trail rides . They have very nice bloodlines which provide not only beautiful pups but nice level headed working Aussies. A great addition to any farm or new family member. BOTH parents have had CLEARED Genetic testing completed listed below. 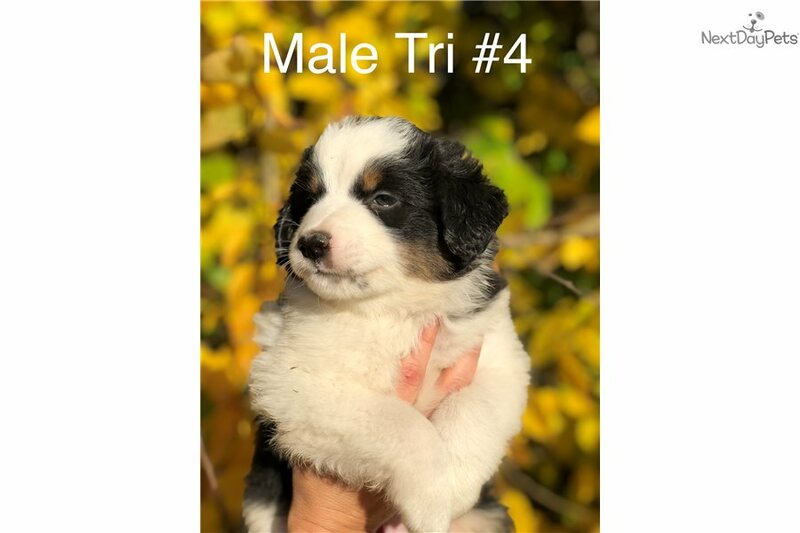 Every puppy will come with NSDR Registration , MICROCHIP & up to date vaccines , wormings at 2,4,6,8 weeks of age along with a health certificate for each puppy from our vet to insure health & TRUPANION PET INSURANCE before going to their new homes . And copies of GENETIC REPORTS of both parents. Dew claws & tails docked. Accepting 200-250$ deposit to reserve your chosen puppy to approved homes.